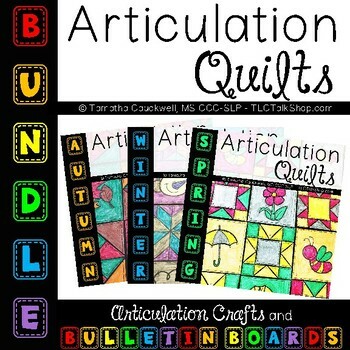 This Seasonal Articulation Bundle provides multiple opportunities to target articulation while keeping little hands busy coloring! Best part is that when students are done, you have a beautiful bulletin board! 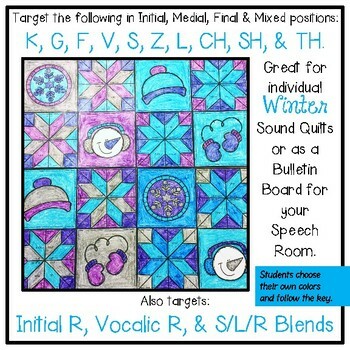 Articulation Quilts are a great way to work on speech sounds at each child's level (word, phrase, sentence). Each set has two different patterns to choose from or use both. Speech words are found within the pattern. 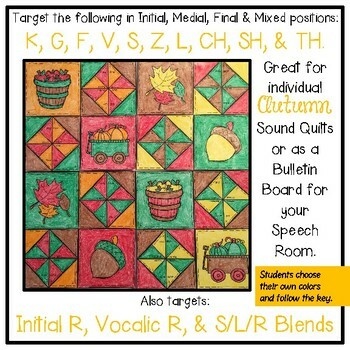 Students create their own key to follow, color, and practice their speech as they create. Each set targets the following sounds in each word position and on mixed pages: K, G, F, V, S, S-blends, Z, L, L-blends, CH, SH, TH, Initial R, Vocalic R, and R-blends. Give one quilt square per therapy session and after four sessions a student can make their own individual quilt! 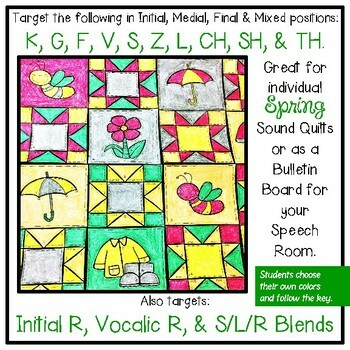 Or piece all of your student quilt squares together to make a beautiful Speech Quilt Bulletin Board. Don’t forget that leaving thoughtful feedback earns you credit towards FREE TPT purchases and it helps me to better help you! I love and appreciate feedback! Be sure to follow me to be notified when new resources are posted. New Products are always 50% off for the first 24 hours that they are posted! You don’t want to miss those savings! You can check out my blog TLC Talk Shop for tips, tricks, and to talk shop about all things Speech and Language related. You can also catch me on Instagram and Facebook and get all the latest on giveaways and exclusive freebies.